This article is about Mario & Sonic at the Olympic Winter Games for the Nintendo DS. For the Wii version of the game, see Mario & Sonic at the Olympic Winter Games (Wii). Mario & Sonic at the Olympic Winter Games is a sports game for the Nintendo DS with a Wii version of the game released as well. Both games are a follow-up to Mario & Sonic at the Olympic Games. The game is produced under license from the International Olympic Committee in relation to the Olympic Winter Games taking place at Vancouver in 2010. Although Sega was handling most of the development for both versions of this game, as it did for the original Mario & Sonic at the Olympic Games, they were also handling publishing/marketing duties for all territories outside of Japan, South Korea, and Taiwan, while Nintendo has done publishing/marketing duties for Japan, South Korea, and Taiwan themselves. The DS version features Adventure Tours, a single player mode with a plot that involves Bowser and Dr. Eggman's scheme to melt all the snow by capturing the Snow Spirits. The Adventure Tour introduces one of the spirits called Frosty. Just as seen in the Wii version of the game, the DS rendition includes the introduction of boss characters appearing in the Adventure Tour mode. These bosses will be present in certain events where the player will have to compete against them to clear their missions. Also, all authentic (real-life based events) are unlocked from the start. Dream Events are in this game and all of them need to be unlocked. All of the characters from the Nintendo DS version of the previous game return. There are also new characters who were not present in Mario & Sonic at the Olympic Games. Retaining the first game's style, all playable characters are unlocked from the start. The single player mode has a set of Adventure Tours which revolve around a plot involving Bowser and Dr. Eggman's scheme to melt all the snow by capturing the Snow Spirits in Christmas Village. 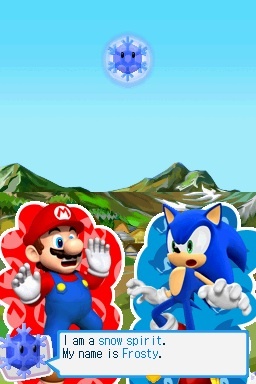 Mario and Sonic travel to the Winter Games when they discover the snow is gone. Upon meeting the Snow Spirit Frosty, they find out Bowser and Eggman melted the snow and kidnapped the other Snow Spirits. Mario runs into Toad, who decides to travel with the two to confront Bowser and Eggman. Mario and Sonic are the only playable characters in the hub worlds. Mario can go down pipes and can use power-ups, while Sonic can use his Spin Dash and Homing Attack to create pathways and knock down bridges. They are also the only playable characters in certain situations, such as Mario recruiting Peach and Sonic competing against Jet. Luigi is found at Frostown. He wants Mario or Sonic to challenge him on Cross Country. After Mario or Sonic beats him, he joins the party. While at Sparkleton, Luigi helps Mario and Sonic look for the key. A Boo scares him away, which makes Luigi bump into a tree. The key drops from the tree, and the Boo steals the key. After Luigi gets the key in less than forty seconds, the Boo runs away and reports to King Boo. After the players clear the ice walls at Polastraits, King Boo is angry when the Boos tell him that Luigi upset them in Sparkleton. Luigi challenges him on Alpine Skiing GS. After Luigi beats King Boo, King Boo flees. At Frostown, Miles "Tails" Prower knows Mario and Sonic is with him. He wants Sonic or Mario to challenge him on Ski Jumping match. After Tails is beaten, he wants Sonic to take him along, wanting to provide support. Meanwhile at Sparkleton, Amy Rose needs Tails's assistance; her rifle is broken, and she wants him to fix it for her. Tails does not test it prior to fixing it; because of this, Amy challenges Tails on Ski Shooting. While the players are at Polastraits, a gate that is similar to the one at Frostown is present but Yellow Shy Guy wants anyone to try it if it works. Tails knows that the gate of Polastraits works, but Toad thinks that the players should head to Frostown to look at that broken gate. At Frostown, Tails can try to fix the gate. After Tails fixes the part in 15 seconds, the gate opens similar to the one at Polastraits. In Frostown, there is a Thwomp in the corner blocking the way. Toad suggests that they need Princess Peach to do something with Thwomp. Peach is found at Sparkleton, and she is looking for Mario but she meets Sonic. Peach is excited to see Mario again. Toad does not know that why is Peach all by herself; Peach then explains that she came to take a peek at the snow festival. Mario challenges her on Snow Machine Fight. After Mario defeats Peach, she congratulates Mario for completing the mission and she joins the team. Toad then notifies Peach of the Thwomp in Frostown. At Sparkleton, a Goomba has heard that Peach is good at Snow Machine Fight, but he wants to see Peach on the Snow Machine Fight himself. When the players complete the mission, Goomba gives Peach a Shooting Rifle that he got from Bowser. Back at Frostown with the Thwomp, if Peach cheers him up in 40 seconds, the Thwomp calms down and lets players proceed. Amy is found at Sparkleton, and she is looking for Tails because her rifle broke. She wants him to fix it for her, but he did not test it out before it is fixed; she wants Tails to challenge her of Ski Shooting. After Tails beats Amy, her rifle works and she joins the team. At Frostown with the panel, Amy can use her Piko Piko Hammer to push the right face in order. After Amy pushes the buttons in order in less than 40 seconds, the gate opens. At Polastraits, Amy tells Big the Cat about the sign near him. She attempts to explain, but Big does not understand. Toad tells her that it is easier if she can show Big by demonstrating the mission, Alpine Skiing GS. After Amy completes the mission, Big says he is paying attention while Amy is skiing. He then gives Amy a Spark Luge he found while he was fishing to thank her. At Sparkleton, there are five lights near a gate but no one can reach it. Toad suggests that they need to find Yoshi so he can reach the five lights. Yoshi is found at Polastraits and he wants to be challenged on the Luge. When Yoshi is beaten, he congratulates Mario and Sonic and joins the team. Toad tells him about the lights in Sparkleton. Yoshi then arrives at Sparkleton, lighting the lights by sticking out his tongue. After the lights are lit, the gate opens. At Cubyrinth, Yoshi tells everyone that it is easy to get lost there. He puts his Drift Board down and goes for a walk; he promptly gets lost and loses his drift board. Birdo finds the drift board that Yoshi lost and claims it is hers, despite Yoshi's consent. Birdo then says that the board has to belong to the top athlete, and gives the board back if Yoshi completes the Ski Cross Racing challenge. At Frostown, Knuckles the Echidna is seen on a mission sign. He joins the team after they beat him at Biathlon. At Polastraits, he helps Cream the Rabbit open the chest. The chest contains a Fighter's Stick, but Cream gives Knuckles the stick after he wins the Luge mission. At Cubyrinth, there is a lever that has an unknown function. After Knuckles pulls the lever, everyone falls down from Cubyrinth to Polastraits. The team is trapped in an unknown area, but Knuckles can crack the large piece of ice obscuring the way in 45 seconds. When the team opens the gate, Rouge the Bat is looking for Shadow the Hedgehog. Shadow is found at Cubyrinth; he wants anyone to challenge him on Ski Cross Racing. After he is defeated, he spots a flying treasure hunter on the way, and he joins the team. He can use his Chaos Spear to attack. Back at Frostown with Rouge, Rouge wonders where Shadow was. Shadow tells her that he has been at Cubyrinth looking for her. Rouge then tells him that she is going to look for whitestones. At Sparkleton, there is another gate and pictures in tracks instead of panel. Shadow can use his Chaos Spear to stop the pictures. After Shadow stops the pictures in the right order in 40 seconds, the gate opens. At Icepeak with Rouge, Bowser, and Dr. Eggman, Shadow tells Rouge that they have an agreement to search for whitestones together. Rouge tells him that the opportunity is too good to pass up. Shadow challenges her on Figure Skating match. After beating Rouge, Shadow has confidence in Rouge that they can release the snow spirits together. Right after the gang defeat King Boo, Toad encounters Silver the Hedgehog and Blaze the Cat near a mission sign. The duo explains to Toad how they escaped and came to Polastraits. They tell Mario and Sonic they're going to join the team when they lose to them in a match of Ice Hockey when they get 1 point in the beginning. However, devastated that they lost, they magically disappear. Toad is surprised about what happened. Later in Cubyrinth, Mario, Sonic and Toad encounter some strange Robo Balls at the beginning of the maze. Toad suggests they need to find Silver and Blaze again. Later in the same place, they find them again. Silver tells the trio that he and Blaze are sorry that they disappeared. Then he challenges the gang to a match of Fever Hockey when they receive 30 points in the beginning. Once the gang defeats the duo, they officially joins the group. Toad then tells Silver about the robo balls. Silver helps the gang by stopping the Robo Balls with his physic powers within 15 seconds. He is later required to get Donkey Kong on the team in Icepeak. In the same location, Toad encounters a strange room with 4 blocks with the marks of Bowser, Eggman, Bowser Jr. and Metal Sonic. Blaze tells Toad that she will help them with the blocks in the correct places within 45 seconds. afterwards, a gate opens, leading the gang to a treasure chest with a Leader's Curling Stone inside. Later in Blizland, she is required to get Daisy to join the team. When Mario, Sonic and Toad encounter a mysterious pole with a button on the top in Polastraits, Toad says that they need to look for a character who climbs a lot. Later in Icepeak, they find Donkey Kong crying due to the fact that one of his bananas fell in a deep ledge and he can't reach it. Silver then comes out and uses his physic powers to get the banana back to him. Donkey Kong thanks Silver and challenges him to Moguls in order to join the party. When Silver finally defeats him, he joins the party. Toad tells him that there's a pole back in Polastraits. There are also obstacles on the pole, such as ice and bombs. When the ape presses the button on the pole, in their amazement, a bridge forms. Later in Icepeak, Donkey Kong asks Vector about his headphones. Vector tells him that he likes music in his own band. After beating Vector, Donkey Kong wants him to join the party. In Cubyrinth, Vector the Crocodile is mentioned by Charmy Bee when Mario, Sonic the Hedgehog, and Toad run into him when the bee refused to let the trio get pass him. Toad then tells Charmy they will let him know when they see Vector. Later in Icepeak, Vector is seen next to a mission sign and he knows Mario and doesn't know that if Sonic is with him. He tells the trio he will join the group if Donkey Kong defeats the music-loving crocodile in a match of Short Track 500m. Once Donkey Kong defeats Vector, he then joins the party. Toad then tells Vector that Charmy needs to see him back in Cubyrinth. When they arrive in Cubyrinth, Charmy tells Vector in order to open the gate, he must engage in a quiz based on Real and Dream Winter Olympic sports and the islands of the snow spirits. He tells him if he gets 5 questions correct within 45 seconds, he will open the gate and let them through. Vector succeeds, and they go through. Espio is seen when he tells his friend to let him know how many more whitestones are there in Sparkleton, Cubyrinth, and Blizland. When all the whitestones are found in those islands, he gets surprised that there's none left when the player collects all of them. Princess Daisy is mentioned when Mario, Sonic, and Toad run into a Chao at Icepeak who when asked about the patch of Freezaleas says he "promised to show them to Princess Daisy". Toad comments on how they should let Daisy know if they run into her. It is later in Blizland that Daisy is found practicing her Ultimate Figure Skating. When Toad questions whether or not Bowser and Eggman brought her there she mentions, "I was just doing some skating in Blizland, and Bowser and Eggman showed up. They started making a castle and a base, and now look at the place! Talk about an unpleasant surprise!". She then explains how she has been in hiding. When she see's the "entourage" of help Mario has gathered she spots Blaze and they strike up a conversation that leads to Daisy challenging Blaze to a round of Ultimate Figure Skating. The player is required to beat Daisy as Blaze. After Toad mentions the Chao's Freezalea patch in Ice Peak, Daisy joins the group, she tells her friends she wants to go to Icepeak as quick as possible. When they arrive in Icepeak and Daisy is presented the Freezaleas from the Chao, she points out that she saw someone and Chao exclaims, "Kiki's going to destroy the flowers!". A stray Kiki begins wrecking the garden and Daisy is prompted to complete a mini-game to chase the monkey away. Daisy decides to try hitting the monkey with snowballs to stun him. However, Kiki is on the defensive mode by attacking her with snowballs. Afterwards, the Kiki runs away and in the process opens a previously sealed gate. When Lakitu is encountered in Ice Peak, he mentions to Daisy that it would boost popularity of the missions he's in charge of if she were to compete in them. He also mentions that he will reward her the Meteor Curling Stone if she can complete the missions. The first mission objective is a Short Track event that must be completed in first place with no recovery zones. After completing it, Lakitu informs them to receive the reward, they will have to actually find the second mission and complete it as well. The second mission is found much later in Blizland and it is an Intense Short Track event. In the event, Daisy is required to reach the goal without falling from the course. Once completed, Lakitu will offically give Daisy the Meteor Curling Stone. Mario and Sonic encounter Wario and Waluigi in Polastraits. The duo tell them they need to defeat them in Bobsleigh in order to join the team. Once they defeat the duo, enraged, Wario and Waluigi begins to run toward the thin ice, create a hole on it, and then jump into the cold ocean. Toad is surprised to learn about it. Much later in Icepeak, Toad finds Wario and Waluigi again. The duo tells them they were enraged because they lost. So they offer Mario and Sonic to defeat them in Snowboard Cross or else they will not join the team. Once Mario and Sonic defeat them, they officially join the team. Later in Blizland, they encounter a Chain Chomp who is blocking the way. Wario decides to perform a Wario Waft to knock it off the platform. Once it gets knocked off the platform, the player proceeds their mission to save the Snow Sprits. Toad later runs into a Shy Guy to inform Waluigi about the secret location back in Cubyrinth. Once they get transported back there, Waluigi throws Bob-ombs at a Bomb Flapper. Afterwards, a hole forms and they discover a secret place with Shy Guys. While at Blizland, Waluigi tells Dark Chao that he is stewed because Bowser and Dr. Eggman pulled a fast on him and Wario told him that they offered him food to teach Chao to think with his stomach. Wario guessed not everyone can be as smart and as good-looking as him. Dark Chao told them that they didn't have to say it. Princess Daisy tells Wario and Waluigi to apologize. Nintendo DS Carolyn Petit, GameSpot 6/10 "You can compete against friends on local wireless in the game's events and a handful of party games, such as bingo. Download play lets you compete in most events with up to three opponents using just one cartridge, and it's certainly more fun button-mashing and screen-scratching with friends than alone. But even with friends, the events just don't hold up for very long on their own and are quickly forgettable. The Adventure mode is the best thing this game's got going for it, and it makes good use of its characters. The fact that it finally unites Mario and Sonic on an actual quest makes it a novel gaming experience that you may enjoy in spite of its significant flaws." Nintendo DS Mark Bozon, IGN 7.5/10 "Mario & Sonic at the Olympic Winter Games still has a bit of a farmed out feel to it. The game lacks the soul of a first party Nintendo offering, and the re-used assets and key art found in dozens of other games, posters, or box art gives the appearance that this game was somehow built off old standby content and not hand-crafted by the companies that brought you these fine mascots in the first place. It's fun to see Mario team up with Sonic, even if the story in Adventure Tours mode doesn't make a whole lot of sense, and the events, while still hit or miss, offer far more compelling gameplay mechanics and a whole lot more depth. Both the DS and Wii versions of this franchise are going to sell like hot cakes every time a new Olympic season rolls around, but at least players will have a reason to keep coming back to the DS game long after the waggle-fest on Wii wears thin." Most of the DS profile artwork is borrowed from earlier games like Super Mario Galaxy, Super Mario 64 DS, Mario Party 7, Mario Party DS, Dance Dance Revolution: Mario Mix, Mario Party 8, Sonic the Hedgehog (2006), Mario & Sonic at the Olympic Games, and Sonic Unleashed. Other art is either new or borrowed from the Sonic Channel. For the female participants in this game, the difference in their profile arts is that they are wearing their respective winter outfits. An app based on this game was released for Apple's iPhone and iPod Touch, but only features Sonic characters and thus is named simply Sonic at the Olympic Winter Games. This game has since been removed from the App Store. Dry Bowser is not present in the photo that shows the bosses at the end of Adventure mode. The sounds used for the Super Mushroom and the Mini Mushroom are the ones used in New Super Mario Bros. for the same items. This page was last edited on March 30, 2019, at 07:17.